Our Hello staff take the time during our intake process to learn everything they can about your family and what’s important to you before making a treatment plan and starting services. Our Hello staff collaborate with you to help you through the complex worlds of understanding disability, navigating insurance coverage, and plotting a therapeutic path. Our Hello staff want to see your vacation photos, hear about your pets, learn about how siblings are feeling, and get to know you beyond your child’s challenges. Our Hello staff work with kids and families of every variety, and we love and support them all with open-hearted compassion. Our waiting room is our living room and everyone is welcome here. Our Hello staff know that we can only provide kids with intervention that is relevant to their specific needs if we are open to working with and supporting the goals of other professionals in your life. Our Hello staff understand that therapy cannot be approached from a one-size-fits-all perspective. There is variability among and within all kids, and the plan for your family will be yours and yours alone. 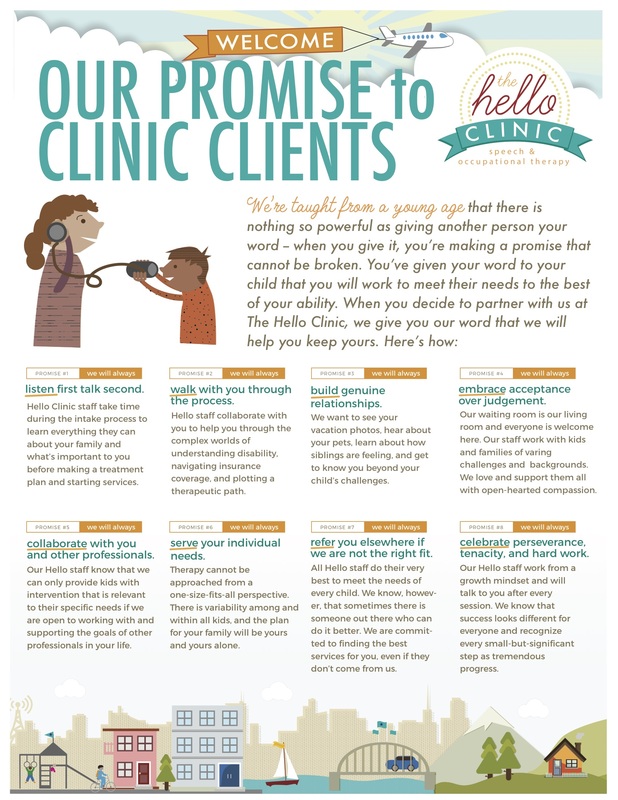 Our Hello staff do their very best to meet the needs of every child. We know, however, that sometimes there is someone out there who can do it better. We are committed to finding the best services for you, even if they don’t come from us. Our Hello staff work from a growth mindset and will talk to you after every session. We know that success looks different for everyone and recognize every small-but-significant step as tremendous progress. This is what you can expect from every one of us at Hello, every day. It’s our honor and privilege to serve you and your family.